Grand Hotel Varna Resort offers luxury hotels and first class services. The property consists of the following hotels: Grand Hotel Varna hotel, Dolphin hotel, Lebed hotel, Rubin hotel, as well as few other hotels, such as Rusalka hotel. Grand Hotel Varna is a perfect choice for business travelers. The complex operates all year round. It is one of the most stylish and luxurious hotel complexes on the Bulgarian Black sea coast. Contact us for more information, bargain rates and online bookings. 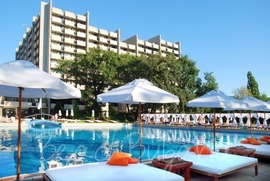 Grand Hotel Varna is a year round hotel, situated 250 meters from the beach, only a 10-minute drive from Varna. The hotel is part of the award-winning Grand Hotel Varna Resort & Spa complex. Dolphin hotel is located on the beach in Grand Hotel Varna Resort. The hotel is part of the World Travel awards 2011 winning complex. Dolphin Marina hotel is situated on the first line 150 m from the sea. Dolphin Marina hotel offers 131 twin rooms, 32 interconnected rooms and 20 junior suites. 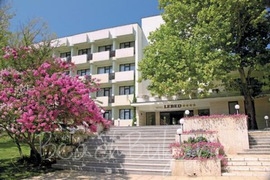 Lebed Hotel is located 200 m form the sandy beach in Grand Hotel Varna resort. The hotel offers 84 twin rooms, 20 interconnected rooms and 4 junior suites.